How to Restore a Mid-century Storage Cabinet - Schoenbauer Furniture Service, Inc.
A: Woodworkers skilled in restoring furniture can generally work on pieces of different vintages, provided they take the time to understand the nuances that make various periods unique. That said, if you go to someone experienced with mid-century pieces, you’re likely to get more help in understanding exactly what you have and how to preserve it. Someone who doesn’t appreciate modern design might be more inclined to try to reimagine it. 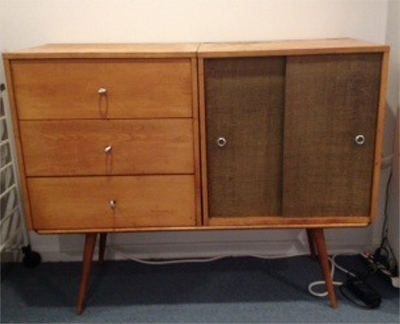 Luckily, mid-century pieces are very popular, so you have several specialists to choose from. Doug Meyers, owner of Modern Mobler Vintage Furnishings in Washington and Kensington (571-594-2201; www.modernmobler.com), and Pierre Paret, owner of Acme Mid-Century + Modern in Alexandria (703-836-0333; www.acmemidcentury.com) both said they’d be happy to do the work. And Glynn Romero at Millennium Decorative Arts in Washington (202-483-1218; www.millenniumdecorativearts.com) offered this tip: He’s had great results from Schoenbauer Furniture Restoration in Charlotte Hall, Md. (800-955-7603; www.schoenbauer.com). Paret looked at the pictures you sent and agrees that you do appear to have a modular storage unit from the Planner Group collection of Paul McCobb, an American industrial and furniture designer who died in 1969. The sleek Planner Group designs, made from 1949 to 1964, were so popular that many manufacturers tried to copy them. One hint that your piece could be an original is the texture of the sliding doors. The panels appear to have a grasscloth covering, a McCobb innovation. The overall style, the drawer pulls and the colors are other tips. But to be sure of the lineage, Paret would inspect how the legs are attached. Don’t do any more refinishing than the piece really needs, or you could lower its value. “Generally, less is better with a piece of this age unless it has damage or significant wear,” Paret wrote in an e-mail. He suggested you might want to refinish only the top, which typically gets the most dings. Until the scope of work is determined, there’s no way to estimate what refinishing would cost. But Meyers estimates that a fully restored Paul McCobb bench could sell for $1,500 to $2,000 in a store that specializes in pieces of this vintage.